Armed with one of the niche’s most cutting-edge and revolutionising trading platforms, UFX is definitely one of the most appropriate global trading partners. If you unite hedge fund managers with IT specialists and seasoned financial experts, you will see why this superb team has crafted a ground-breaking gate that opens into the competitive, yet very exciting, world of the financial markets. UFX’s key values epitomise determination, devotion, and excellence which assure that they provide anything a keen investor needs to achieve its goal – making a profit on the market. Additionally, UFX is a Straight-Through-Processing (STP) brokerage firm, which means that it does not engage in opposing trades to its customers, and it offers stable and fixed spreads. The absolute masterpiece that their platform is, caters to all-level traders, and they pride themselves on impeccable support centre as well as first-class reliability. UFX is an internationally respected brand in the online trading space since it was established in 2007. Four years after that, it started abiding by the highest international standards for security of funds and customer protection when EU’s CySEC commenced overseeing its activities. Believing that anyone can turn into a successful investor with the right tools in his or her arms, UFX has neatly crafted five (5) trading accounts. The first one is the Mini account whose minimum deposit is just $500 and comes with a minimum trading volume of $5,000. It derives advantage from a personal trading trainer, daily recommendations, a video library, and daily reviews of the markets. The Standard account’s minimum deposit is $1,000 while the minimal amount of its trading volume is $10,000. The benefits for this account are a video library, daily recommendations, a personal trading trainer, exclusive updates, daily market reviews, and a VIP trading support. The Gold and Platinum accounts have many similarities when it comes to bonuses. They are both entitled to SMS trading alerts, a VIP trading support, daily reviews of the financial markets, exclusive updates, a personal trading trainer, daily recommendations, a video library, and a perk which is only accessible for these two – an access to the MT4 platform. The only two differences are the minimum deposits and the minimal trading volumes which are $5,000 and $50,000 for the Gold account and $10,000 and $100,000 for the Platinum account. The fifth account is an Islamic account tailored for Muslim investors to be compliant with Sharia stipulations. The minimum deposit for it is $1,000 while the minimal trading volume is $10,000. The Islamic account is eligible for daily market reviews, an access to a video library, daily recommendations, and a personal trading trainer. All five accounts get 24-hour live help. UFX is jam-packed with amazing platforms that serve any level of trading expertise and are appropriate for investors from all walks of life. The one-of-a-kind MassInsights Technology of UFX is a ground-breaking technology that permits a Live Stream of market events & aggregated trader behaviour. The platform’s stream elements comprise of Trending (real-time trend activities about a specific asset), Volatility Spotted (when the system notices a rapid BUY/SELL activity in regards to a specific asset), Volume Growth (when a larger-than-usual growth of a given asset is detected), Going Up/Down, as well as Financial Events Calendar and Market News (notifying you about important market updates and news). Epitomising truly sophisticated technical analysis, advanced tools for trading, and enjoying worldwide fame, the MT4 is the perfect way to hone one’s competences and spot profitable trade deals. UFX’s MT4 possesses a fully customisable interface, automated features for quicker trading, and a comprehensive tool for innovative technical analysis. It is downloadable in a matter of minutes. Should you like to trade download-free via your Internet browser, then the ParagonEX WebTrader is your cup of financial tea. It is the most advanced and smartest platform entirely web-based and outstrips the competition with very chic, yet simple-to-use, features. Both for iOS and Android, the UFX mobile application allows you to never miss a trading opportunity. Not only it includes the MassInsights technology, permitting Live Stream of market events, but it also lets users trade quickly, utilising fast trading executions and advanced asset charts and sophisticated tools for trading. Rest assured that trading at UFX is completely safe and very pleasant due to some extra precautions that the company has taken to safeguard that client data is secure. These measures and precautions comprise of advanced Verisign SSL utilised to verify users; two-layer firewall to avert unauthorised attempts to access any data at the website; separate servers for transaction information and trading activity that are in different locations and are armed-guarded 24/7; and finally – an up-to-date trading platform that is regularly updated to thwart any bugs. Besides having a brilliant security construction, UFX also punches above its rivals’ customer support weight by providing a terrific client service via a live help, numerous fixed phone lines, an e-mail, a contact form, and through Whatsapp or Viber. Limassol, Cyprus, is UFX’s centre of operations and the website is accessible in English, Vietnamese, Malay, Indonesian, Arabic, Japanese, Turkish, Spanish, German, Czech, French, Italian, Dutch, Polish, Swedish, Chinese, Bengali, Romanian, Russian, Portuguese, Hungarian, Finnish, Norwegian, and Danish. Funding your UFX account is safe, quick, and quite simple. VISA, MasterCard, Maestro, VISA Electron, and Diners Club are the credit cards you can use to execute deposits. In addition, deposits can be done via Bank Transfers and e-wallets, such as Sofort, Skrill, ELV, NETELLER, Giropay, iDeal, China UnionPay, CashU, Qiwi, WebMoney, POLi, Paysafecard, as well as Bitcoin. UFX does not permit third party deposits but also does not charge any fees. A minimum deposit of $500 is necessitated. UFX’s withdrawals are performed thanks to the same options you used for deposits. No charges are related to that, but keep in mind your bank may impose any additional fees. Allow between 3 and 10 business days for processing. A very peculiar fact about UFX is that all accounts are only available in USD. 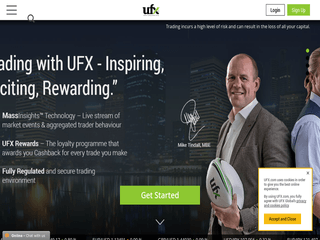 UFX take great pride in its UFX Rewards programme that is one of the sole loyalty programmes in the online trading world which bestows investors with Cashback for every single trade they initiate. Additionally, the Forex enterprise is also proud to provide various competitions and contests that may lead you to sustainable growth. For instance, there is the Lotus Elise trading contest whose prize is a spanking new Aspen White Lotus Elise. Besides, there is a golf contest with wonderful prizes. Stay tuned as UFX frequently invents new ways to pamper its loyal users.